Several years in the making, Schools of Magic: History of Vintage is a brand new series tracing the rich and exciting history of what has become Vintage. Stephen Menendian has been researching the obscure and often forgotten history of Magic’s oldest and most interesting format. For the first time, you can now read the history of Vintage/Type 1 Magic from 1993 to the present. Each chapter will cover a year in the history of the game, highlighting major new printings, innovations and the emergent new decks that resulted. The ultimate payoff for the reader is a profound appreciation for the strategic evolution of the game, and a keen recognition of the ways in which the strategies that emerged in the format that began in 1993-1994 continue unabated today in the Vintage format, from the Weissman school to the O’Brien School. While this series is intended for Eternal fans, and Vintage players in particular, anyone and everyone who enjoys Magic, from the wily Pro Tour veteran to the kitchen table casual player, will enjoy this story. In this inaugural article for the Schools of Magic: History of Vintage series, read the story of 1993 and 1994, from the origins and development of the game to the earliest tournaments, and how these things shaped competitive play as we know it today. Recount the epic story of Zak Dolan and Bertrand Lestree’s famous first Magic World Championship battle, and enjoy the earliest decklists in the history of the format, including Bo Bell’s infamous Mind Twist deck. Read about and enjoy the decks of the Wild Magic and Degenerate Era. Learn how Wizards managed the earliest years of Magic, and how each new set transformed the format we now know as Vintage! Most Magic players eventually acquire a natural curiosity about the history of the game, cards of the past, famous decks and players, and the origins of the game itself. Their curiosity may have been aroused by an encounter with strange cards on stranger card faces in trading binders or dealer cases. It may be a natural byproduct of sustained engagement and enjoyment of the game in its many facets, including an exploration of the deep card pool and an insatiable desire to find hidden gems and obscure, but useful, tactics. One way or another, Magic players eventually wish to know more about the game they find endlessly intriguing. Anyone who plays the game long enough wishes to know what came before. And, as the average age of the Magic player slowly but inexorably rises, this history becomes living history, a part of each player’s experience of the game itself. For all these reasons and more Magic history, especially its early history, is fascinating and timeless. Names like Brian Weissman and Mark Justice ring familiar even to younger Magic players, and the great Schools of Magic, whose principles are perpetually retold, inform our strategic understanding of the game today. Books like the Magic Encyclopedia were sought after because they provided a glimpse into this history. But it was only a partial glimpse. Players want to see the cards and learn the sets, but they also want to know the stories that give them meaning and bring them to life, innovations like The Deck in their original context, and appreciate how those innovations changed the game itself (such as changes in the Banned and Restricted List). Never before has there been a narrative that covers this history. I will attempt, as best I can, to correct that omission. This bold new series is a history of Vintage/Type 1 Magic from 1993 to the present. Each chapter will cover a year in the history of the game. In particular, each chapter will highlight: 1) major new printings, innovations and the emergence new decks that resulted, 2) major tournaments results and the influence of these results on the metagame, 3) changes to the restricted list that resulted from these tournament results, and 4) and the stories behind these developments, the tales of tournament glory and how the players of the era felt about the dominant strategies of the year. 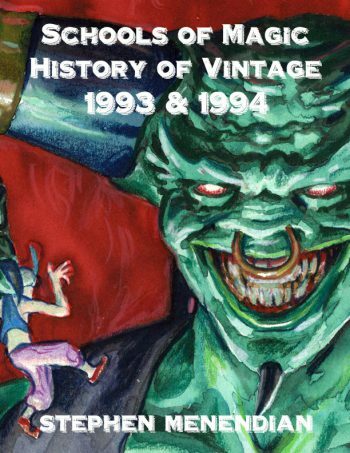 The first chapter covers 1993, the origins of the game, and the pre-History of Vintage, including the various deck strategies that emerged during era of ‘Wild Magic,’ and the early evolution of tournament Magic. The lessons learned in that time became the foundations of the Type 1 format and inform the rules promulgated by the Duelists’ Convocation. The first chapter also explores the challenges of expanding the game, and the enduring legacy of Arabian Nights. The second chapter, 1994, begins with the first restricted list, and covers the first US Nationals, and first World Championship, along with the release of Antiquities, Legends, and the changes that these sets brought. And so on. The ultimate payoff for the reader will be a profound appreciation for the strategic evolution of the game, and a keen recognition of the ways in which the strategies that emerged in the format that began in 1993-1994 continue unabated today in the Vintage format, from the Weissman school to the O’Brien School. While this series is clearly written for Eternal fans, and Vintage players in particular, anyone and everyone who enjoys Magic, from the Pro Tour veteran to the kitchen table casual player, will gleam insight and understanding from the stories and lessons of Magic’s incredible history. The reader will be left with not only a better appreciation for the genius of the game, but above all a recognition that Magic is a game that truly has a life of its own far beyond what it’s designers could have imagined.